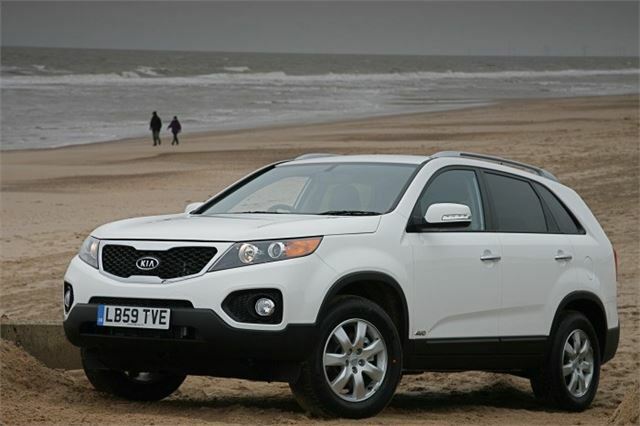 The 2nd generation KIA Sorrento II owes a lot to the latest Hyundai Santa Fe. By Martin Gurdon. 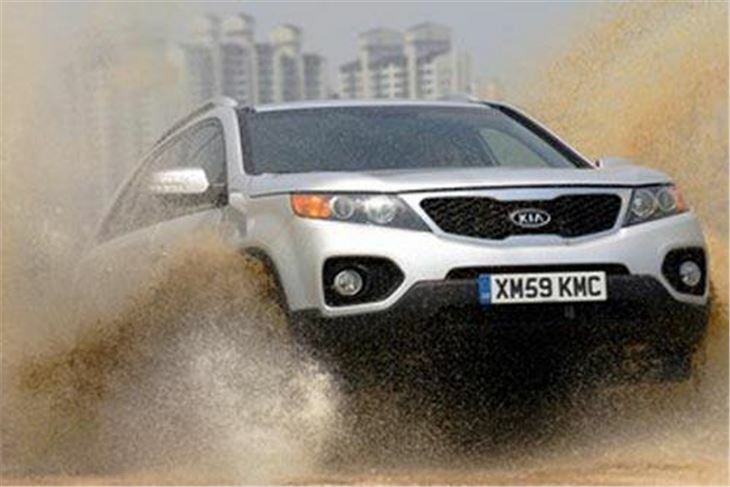 Kia’s previous Sorento was a tough, very capable towing vehicle that people with smaller-than-Range-Rover budgets could afford. With its well-regarded 2.5 litre direct injection diesel engine, hefty separate chassis frame, and the ability to lug around up to 3,500kg, it was the sort of car you’d find attached to a big caravan or a trailer loaded with building materials. 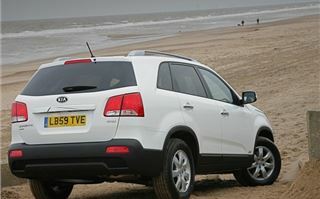 Now Kia has launched its replacement, which retains the outgoing model’s lots-of-metal-for-the-money credentials, but in other ways is a very different sort of car, aimed squarely at the leisure rather than workhorse 4x4 market. This means it no longer drives like a bit like a small truck, but nor does it have the towing capacity of one; in fact its load-lugging limit of 2,500kg is 1,000kg less than before and the auto can only tow 2,000kg. Many potential buyers are unlikely to care. Costing from £23,495 in seven-seat 2.2 diesel, six-speed manual guise (there are six-speed autos and there will be 2.4 litre petrol and two-wheel-drive variants), the car is now pitched firmly at the likes of Toyota’s RAV-4, Honda’s CR-V and Land-Rover’s Freelander, and has the advantage of being bigger than any of them. As a family holdall it has a lot going for it. 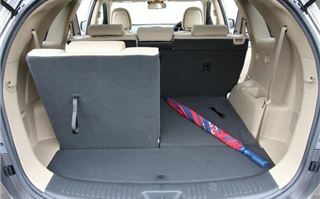 The third row of seats collapse forward to create a big luggage area, which can be expanded further still by doing the same to the middle row –total space is up by 96 litres. This is an entirely idiot-proof process involving pulling a lever and yanking a strap. These seats also recline. Safety-wise, the fat B pillars –the ones behind the front doors- contain a rollover hoop, although they, along with the rearmost pillars, also create notable blind spots. 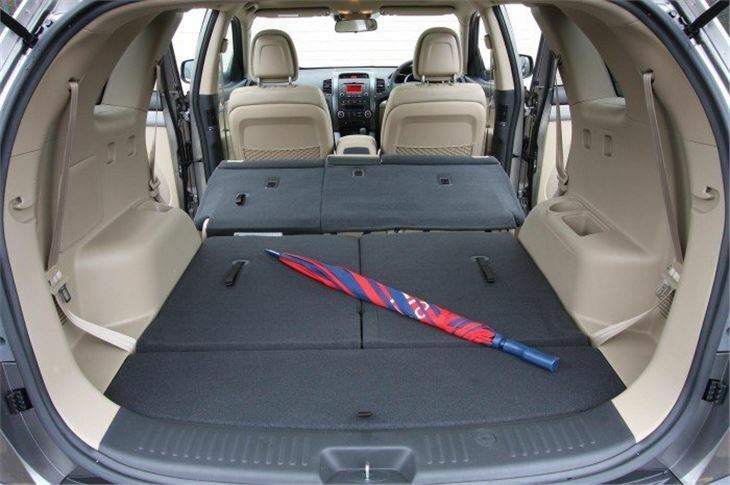 There are six airbags, active front headrests, and a phalanx of traction control devices that prevent the wheels locking, and distribute different braking loads to individual wheels. Electronics also control engine torque to reduce the power if a driver starts to unstuck the car with over-exuberant cornering, or it encounters a slippery road surface. 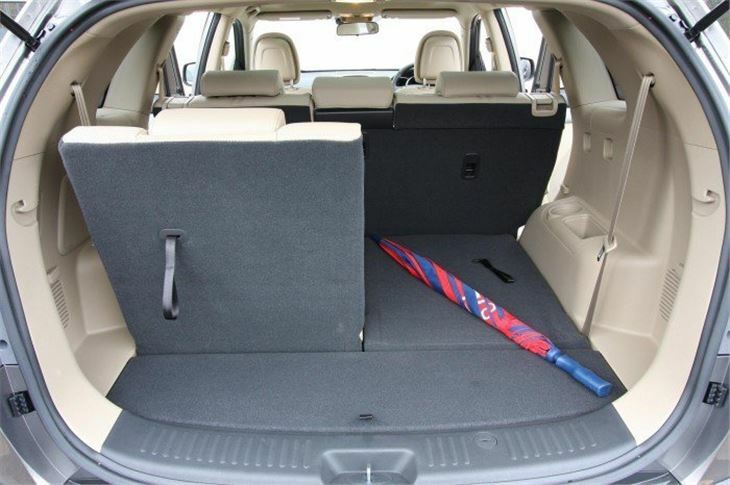 With its high seating position and big doors, getting in and out of the Sorrento is straightforward, even when vanishing into the very back, which is spacious for pre-teen children and not bad for adults, three of whom would find the middle row of seats entirely commodious. The rest of the interior is unpretentious and well screwed together. It’s also well thought out with plenty of oddments stowage space, and there are features like separate driver and front passenger climate controls, although it’s the driver whose in charge of how hot or cold the car gets unless their companion begins knob twiddling. The old Sorento diesel had a 2.5 litre engine. This one uses a 2.2, mated either to a slightly vague six-speed manual or an unobtrusive automatic, also with six-speeds and a push/pull manual override control. Despite the reduction in size, the latest motor is more powerful, producing 196bhp (up from 168bhp), with a 21 per cent boost in torque to 31lbs/ft. It’s also cleaner, with manuals now emitting 174g CO/km instead of 209. The auto’s 194g CO/km figure is 34 per cent better than its predecessor. Thirst has also been reduced, with the manual’s combined 42.8mpg figure 7mpg better than the old model’s 35.8. The latest auto manages 38.2, which is still 8.4mpg up on the old one. 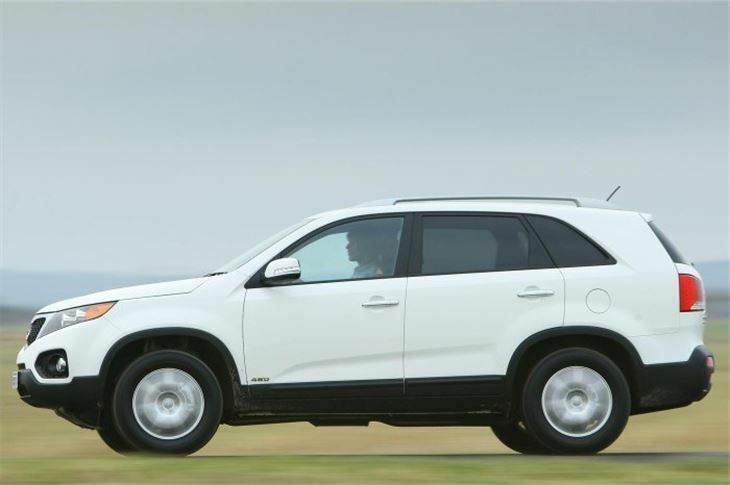 Ditching the Sorento’s separate chassis and shaving 60kg in weight will have helped here, but this change hints that the latest car is aimed at a different market, a point reinforced by the loss of some ground clearance. This hasn’t made it an off road wimp though. The all-wheel-drive system, which often leaves the front wheels to do most of the driving on tarmac, is perfectly capable of taking the Sorrento into the wilds, where its long travel suspension –which gives a comfortable, quiet ride on normal roads- comes in useful, as does a differential lock that distributes power equally to all four wheels at speeds up to 19mph, and a downhill brake control that allows the car to scrabble slowly down steep inclines. 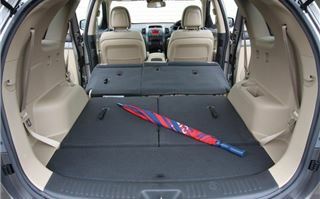 The traction control system will also step in to prevent slipping backwards and wheelspin. The engine’s low speed pulling power suits all this, and on the road makes for a relaxed drive. It produces its maximum power between 1,800 and 2,500 revs, and at the lower end of this scale it happily lugged the car uphill at speeds below 25mph, and when Honest John drove it, he commented that the gear ratios were ideal for towing. It might not be able to tow as much as before, but the consensus was that this car was a lot better to drive on road than its predecessor, which by all accounts had fairly basic dynamics. The new one rolls a bit, but its handling is neutral and well behaved, and the light, unremarkable steering is perfectly accurate. Overall, the car’s driving dynamics are capable but low key. 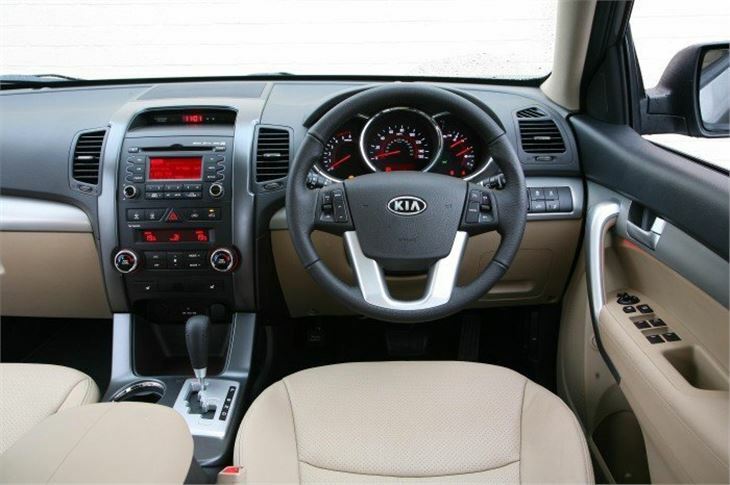 Anyone looking for a sub-Discovery 4x4 with many of the attributes of a people carrier would find a lot to like in the Sorrento, which comes with Kia’s 100,000 mile/7 year warranty. 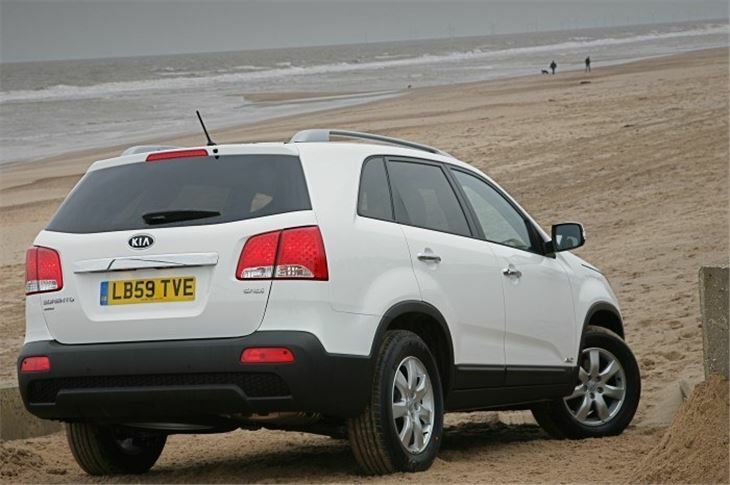 It also has a price which is entry level guise is about £1,200 more than the equivalent Hyundai Santa Fe, which is essentially the same car with perhaps slightly less attractive styling, although that’s subjective. 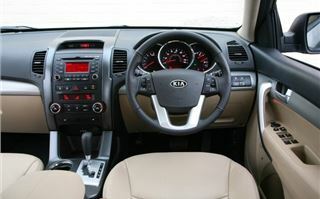 Whether potential buyers will see the Kia as being worth more is likely to hinge on aesthetics, which marque’s dealer gives them the best vibe -and perhaps the best deal.